CivicEngage Send is our powerful communication creation and distribution module. Send multi-channel citizen communications from one easy-to-use system. With CivicEngage Send, you can create your message and send to your list of subscribed citizens via email or text, and/or share to social media. You can even create and send dynamic, informative newsletters with the insights and news your community needs. 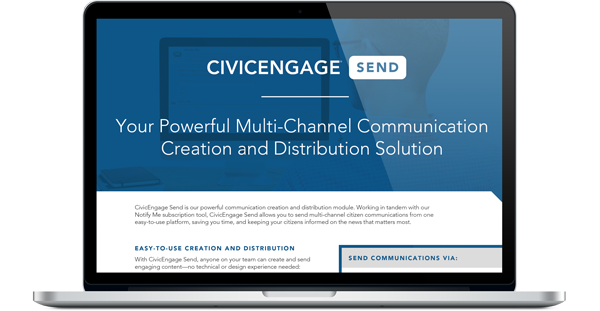 Click to download our fact sheet and learn how CivicEngage Send can allow you to quickly and easily create and send multi-channel communications to your citizens, keeping them informed and engaged. One communication solution. One user-friendly interface. Endless possibilities. do... and nothing you don’t. It’s sending made simple.